There’s only one month left in the regular WHL season, and the Winterhawks are still struggling to match the Everett Silvertips for the top slot in the division. But now the team and their coach/GM must begin to think further into the future, beyond their 5-in-a-row hopes. Chiefly, the organization must plan ahead for the new WHL playoffs format that might cause issues. The 2015 race to the Ed Chynoweth Cup has been tweaked from previous years to include wild-card slots. While the top three teams of each division will fill out the first twelve berths, an additional four teams will finish out the bracket. These wild-card teams are not separated by division, but are rather the two next best records in each conference. For instance, in the U.S. Division the Silvertips, Winterhawks, and Seattle Thunderbirds are currently the top three teams. The Tri-City Americans and Spokane Chiefs still have a shot, but only if their records outweigh the bottom two teams in the B.C. Division. [quote align=’right’]The Winterhawks have demonstrated an idiosyncratic ability to knock off the rougher opposition and still lose to second-rate teams like Spokane and Seattle. [/quote]Both Washington teams are currently listed above Vancouver, Prince George, and Kamloops, thus projecting the Western Conference bracket as being loaded completely with all five U.S. teams, the Kelowna Rockets, Victoria Royals, and (by process of elimination) the Vancouver Giants. Confused yet? Essentially it means the Hawks have their work cut out for them. While Everett and Seattle still seem to vex Portland’s defense every other game, the B.C. standings all but guarantee competition from Kelowna. 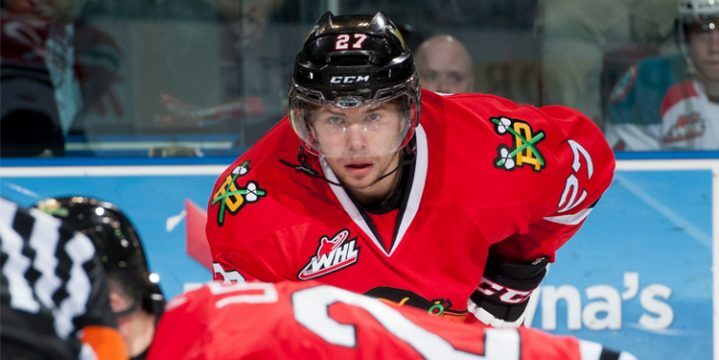 Victoria hasn’t been a large issue for the Winterhawks this season; three out of four meetings have been Portland wins, and the fourth was in early October during NHL camps and early season jitters. But the wild-card format lends some complications. As I’ve written earlier this season, the Winterhawks have demonstrated an idiosyncratic ability to knock off the rougher opposition and still lose to second-rate teams like Spokane and Seattle. The addition of two also-ran squads in the playoffs could result in some lovely tune-up games to align their fundamentals. It may just as easily result in a knock-out due to playing at half-power. Looking at the rankings this way, it’s disheartening to see the Hawks at the number six slot overall, under three teams that have fallen to Portland this year. In order to clinch their playoff slot in style and enter the spring brackets with as much advantage as possible, they will need to finish February with a tighter lid on the forecheck and an offense that remembers to show up for the first two periods of the game. The two recent losses to Seattle and Everett were the result of sloppy defense, but the real crime was a lack of offensive coordination until the axe was really to the grindstone in the final twenty minutes. At no point should the Portland Winterhawks be scoreless halfway into a game against Seattle. Not in the last seven years, at least. This weekend should help, with games against Vancouver and Lethbridge leading to another bout against Tri-City on Tuesday. Three (I think it fair to say) lousy teams to sink some talons into might help the Hawks push forward and not look back until awards season.